NEW YORK, New York — On September 8, the Hayastan All-Armenian Fund unveiled the newly reconstructed Khachatur Abovyan School, with a jubilant opening ceremony held on the premises of the landmark Shushi campus. The facility’s extensive renovations were co-sponsored by the Armenian community of Russia and the government of Artsakh. The opening ceremony was attended by several dignitaries, elected officials, and guests, among them Armenian president Serzh Sargsyan, Artsakh president Bako Sahakyan, and Hayastan All-Armenian Fund executive director Ara Vardanyan. The reconstruction project has comprised extensive renovations and the structural reinforcement of the school’s two wings — a two-story building and a three-story building connected by walkways. The renovations have encompassed a total area of 7,300 square meters. The rebuilt campus features 20 sizeable classrooms, including two computer classrooms, as well as two laboratories, ten classrooms for teaching various specialized subjects, a library, an events hall, a gym in addition to outdoor sports grounds, a cafeteria, and a kitchen. Furthermore, the school is now equipped with its own power substation and a boiler room, which will supply the facility with uninterrupted electricity and heating. The school’s computer rooms were established with the support of Armenia Fund USA (the Hayastan All-Armenian Fund’s U.S. Eastern Region affiliate), through donations by Anahid Beylerian, Arthur and Lucretia Yaghjian, Vasken and Ani Kassabian, Joseph and Jennifer Oughourlian, and the Ajemian Foundation. 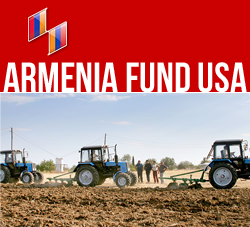 The classrooms, events hall, and gymnasium were furnished with the financial support of the Hayastan All-Armenian Fund’s recently launched Italian affiliate. The Khachatur Abovyan School was originally built in 1974. Today, with its new lease on life and featuring attractive grounds and state-of-the-art amenities, it has once again become a source of civic pride for the residents of Shushi. While currently over 330 students attend the school, the campus can accommodate up to 1,200 students, as it did prior to the 1990s, and as specifically envisioned by the reconstruction project.